200 Year 10 students for an inspiring and action packed day. And what a day it was! Participants were treated to a jam-packed programme full of speakers ranging from a diverse mix of backgrounds. Miss Potter of Kingsway Academy kicked off the event with an introduction. 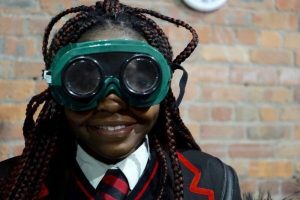 As the most senior female within Northern Schools Trust, she touched on how environments have changed over the years and encouraged students to embrace the day ahead, reflect on the stories they heard and to allow themselves to be inspired by each story. Next up was Barbara Peters, Mortuary and Bereavement Services Manager from The Royal Liverpool. Having worked in a range of sectors beforehand, Barbara gave a fascinating insight into her career to date, citing that an experience working with families in an orthopaedic ward caused her to change her outlook on the idea of caring for others when it came to trauma. 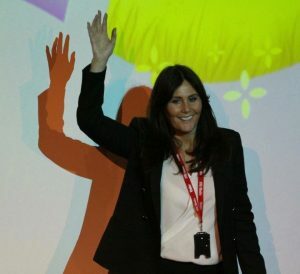 Offering forensic biology career advice to year 10 students, Barbara encouraged them to always take advantage of work experience opportunities, as you never know what they could lead to. Anne Daglish of the Marina Daglish Appeal was up next. She spoke of her experience working with the third sector and overcoming her battle with cancer. Perhaps most inspiringly, Anne professed that in hindsight she views her ordeal as an overall positive experience “The best and most encouraging thing, is always being surrounded by likeminded people.” Anne condoned the power of transferable skills in life, and that fear of rejection should never be a reason for not pursuing something you are passionate about. 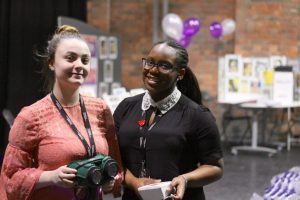 Next up it was on to the dance studio for a range of IWD activities based around key sectors including health, science, history and creative – all in keeping with this year’s theme of ‘Press for Progress’. 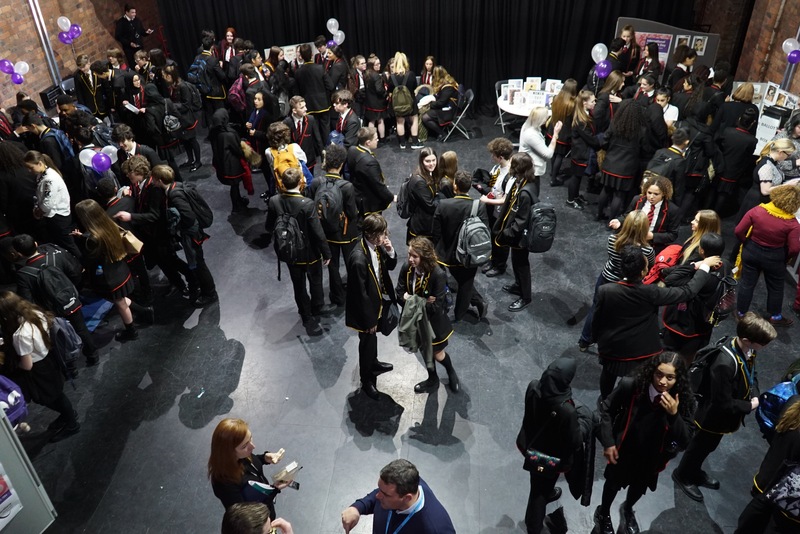 Breakout sessions included a polling station style booth where students could vote for their favourite inspirational figure and a student health team stand involving distortion goggles and a midwifery session. 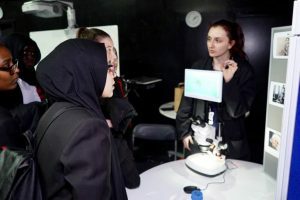 Participants got involved with an inspirational women timeline, reflecting significant role models throughout history, and things got interesting over at the science station as students were introduced to the wonders of daphnia biology using digital microscopes. Interestingly, Daphnia are a mostly female clone species that rarely produce males. They are regularly used in the labs, as when pregnant the offspring are clearly visible due to their transparency. The remainder of the afternoon welcomed another range of fantastic speakers including MP for Wirral South Alison McGovern, Emergency Medical Dispatcher at North West Ambulance Service Wendy Hall. Rounding off the day were speakers Helen Bright, Principal Scientist of Biopharmaceutical Development at Astra Zeneca and finally Robyn Dooley of OH. As founder of her own start up company, Robyn shared her personal journey and spoke of her desire to influence change in the sector. Her commitment to tackling the barriers facing young people trying to get into creative industries is the key driving force behind what she does. “What did you learn from today? What did you like from today? And finally “what did you take from the day that can and will be applied to building your future?” We’re looking forward to receiving answers, the most reflected and considered of which are to be awarded prizes. A massive thank you to each and every participant of this event including all speakers, staff and students. We’re already looking ahead to International Women’s Day 2019!